Turn signals don’t come standard on a bike and arm waving can be misunderstood, but a live-action LED wearable display on your pack or your back gives a clear signal how you’re turning. At least that’s one of the ways you can use a Fos wearable display. Designed by San Francisco-based Anders Nelson, Fos is a totally programable display for your pack, shirt, or even worn as a belt to show your style. Wear it to alert drivers when you’re turning, display health data while you’re in motion or even wear it at a party or club and keep in time with the beat. Anders Nelson has been designing bespoke wearable technology for a number of years through his company Erogear and is using his expertise to create an affordable wearable display for the masses. 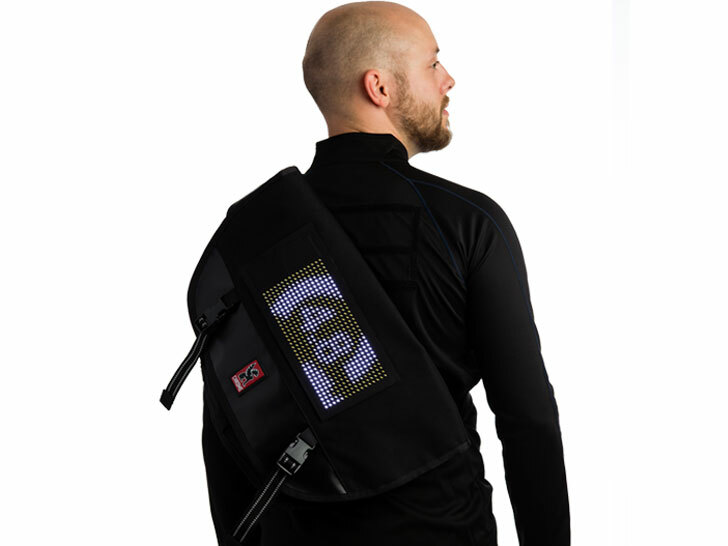 Fos is a flexible LED display that can be controlled via Bluetooth and your phone. Use the Android-based demo application and library package to get started control the display or hack into the program to create your own wording, pictures, or moving light shows. Nelson is currently running a Kickstarter campaign to raise funds for the first round of manufacturing of Fos. You can support the program and receive a differently sized Fos patches that can be velcroed on to anything. There is also a stunning amber-colored Fos leather belt that will definitely make you stand out at a party. All Fos patches are powered by a rechargeable battery pack and start at $149. Turn signals don't come standard on a bike and arm waving can be misunderstood, but a live-action LED wearable display on your pack or your back gives a clear signal how you're turning. At least that's one of the ways you can use a Fos wearable display. Designed by San Francisco-based Anders Nelson, Fos is a totally programable display for your pack, shirt, or even worn as a belt to show your style. Wear it to alert drivers when you're turning, display health data while you're in motion or even wear it at a party or club and keep in time with the beat.